Washington, D.C. —(ENEWSPF)–August 28, 2017. According to the largest and latest study of its kind to date, the economic and educational gains made by beneficiaries of Deferred Action for Childhood Arrivals (DACA) continue to grow. 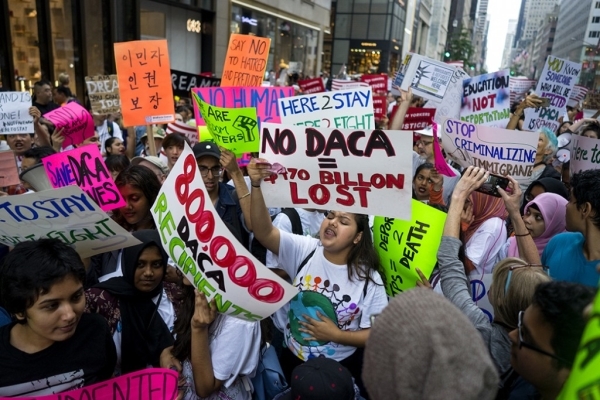 The national survey, published today by Tom K. Wong, professor at the University of California San Diego; the Center for American Progress; the National Immigration Law Center (NILC); and United We Dream (UWD) finds that even during a time when the future of the DACA is uncertain, recipients continue to make positive and significant contributions to the economy, gaining higher wages, buying cars and houses, and starting businesses, benefiting the entire nation. DACA recipients outpace the general population in terms of business creation, with 5 percent of respondents starting their own business after receiving DACA and 8 percent among respondents 25 years and older. Among the American public, the rate of starting businesses is 3.1 percent. DACA has a positive and significant effect on wages, which are important not only for recipients and their families but also for tax revenues and economic growth at the local, state, and federal levels. The hourly wage of respondents increased by 69 percent since receiving DACA, from $10.29 per hour to $17.46 per hour (84 percent among respondents 25 years and older). Purchasing power of DACA recipients continues to increase. Nearly two-thirds of respondents (65 percent) reported purchasing their first car, which is important not only in terms of state revenue but also regarding the safety benefits of having more licensed and insured drivers on the roads. Additionally, the survey found that 16 percent of respondents purchased their first home after receiving DACA. 45 percent of respondents are currently in school, with 72 percent pursuing a bachelor’s degree or higher. Because of DACA, 94 percent of respondents currently in school said they pursued educational opportunities they previously could not. Additionally, the survey found that at least 72 percent of the top 25 Fortune 500 companies—including Walmart, Apple, General Motors, Amazon, JPMorgan Chase, Home Depot, and Wells Fargo, among others—employ DACA recipients. These companies account for $2.8 trillion in annual revenue. NILC is exclusively dedicated to defending and advancing the rights and opportunities of low-income immigrants and their families. Our mission is grounded in the belief that every American—and aspiring American—should have the opportunity to fulfill their full potential regardless of where they were born or how much money they have. Using our deep expertise in a wide range of issues that affect low-income immigrants’ lives, we work with communities in courtrooms and legislatures to help advance policies that create a more just and equitable society for everyone. Tom K. Wong is an assistant professor of political science at the University of California San Diego. He is also the director of the International Migration Studies Program minor. His research focuses on the politics of immigration, citizenship, and migrant “illegality.” As these issues have far-reaching implications, his work also explores the links between immigration, race and ethnicity, and the politics of identity.